It was an exciting weekend of horse racing filled with upset and cheers. From Santa Anita to Belmont Park the thrill and excitement filled the air with surprises stretching from the West to the East Coast! Fall has finally arrived, and we are only 32 days away from this year’s Breeder’s Cup races that will be held at Santa Anita Race Track. The best is yet to come, as we start the count down! Over the weekend, there were a few upsets, but the two that stood out in my book was the Beldame Invitational- G1 and the Jockey Gold Cup Invitational- G1. Princess Sylmar ran down one of the best older female horses around. Royal Delta stumbled out of the gate, but quickly gathered her composure. 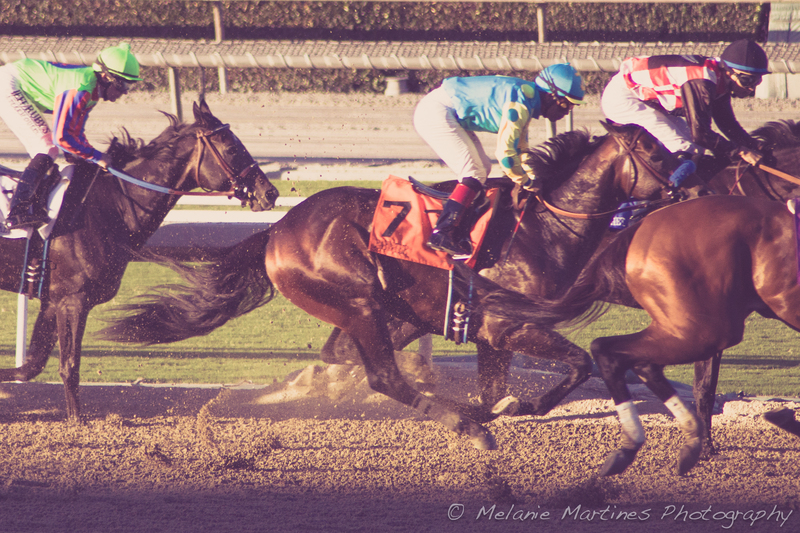 I’m still baffled by this race as I’m not sure what happened, but again we all know horse racing is full of surprises! — I’m sure I was not the only one scratching my head trying to figure out just what happened with this race. This was a solid field with the Kentucky Derby winner- Orb, Belmont Stakes winner- Palace Malice, Travers winner- Alpha, Whitney Invitational winner- Cross Traffic and Multi Graded stakes winner Flat Out. My picks were the best of the best: Flat Out, Palace Malice and Cross Traffic. To understand what happened I have to break down how the race unfolded. Cross Traffic was the expected speed in the race. Strangely, he walked out of the gate, running sluggishly and was unexpectedly dead last. Alpha ran straight to the front similar to his Travers race, and set the pace with Palace Malice right behind him. I was very surprised to see 6-year old Ron the Greek more forwardly placed than usual as Jose Lezcano sat him at the rail in third behind Alpha and Palace Malice. When he finally made his move, he quickly took off from the rail and pulled away from this all-star cast for a huge upset victory with odds of 21-1. He skimmed the rail and cleared the field like a bullet train! Unfortunately, the lost meant there was no 3-Peat for 7-year old Flat Out, trained by Bill Mott. He loves Belmont Park (also known as the Big Sandy), winning 5 out of 6 times at this track. Flat Out was seeking his third consecutive win for the $1million Jockey Gold Cup; a feat that only the mighty gelding Kelso accomplished back in 1962. What is even more impressive is Kelso has been the only horse to win this race 5 consecutive times (1960-1964). Since 1919, a total of 10 horses have won this 1 ¼ race ‘twice’. Interesting addition: Also trained by Bill Mott, Ron the Greek is Flat Out’s uncoupled stablemate. Bill Mott also won the Jockey Gold Cup Invitational back in 1995 with Cigar.